Discussion in 'Gear & Equipment' started by Randy, Nov 20, 2017. So, I finally finished the project from here: http://sevenstring.org/threads/nuad-ceriatone-ots-mini-lunchbox-build.296913/ I still have to post up the time-lapse video (it's sitting on of my computers lying around?). This one was a while in the making. I got it done probably a year ago or more, but hadn't made a headshell for it yet. I started work on the shell, went to do a shakedown run and started having trouble with the 'overdrive' channel, got pissed off and put it away up until a couple weeks ago. Turns out all that was wrong was a single cold solder joint, so I corrected that and got it up and running. The shell is black walnut, which I joined using box joints (dado stack in my table saw). The facing is flamed maple. It got a few coats of Danish Oil, then a coating of 'triple thick' polyurethane. I'm kinda 'eh' about that poly, because it leaves a lot of brush strokes but I got them knocked out with a few passes of steel wool. The biggest part of the project was working around the way it's mounted. 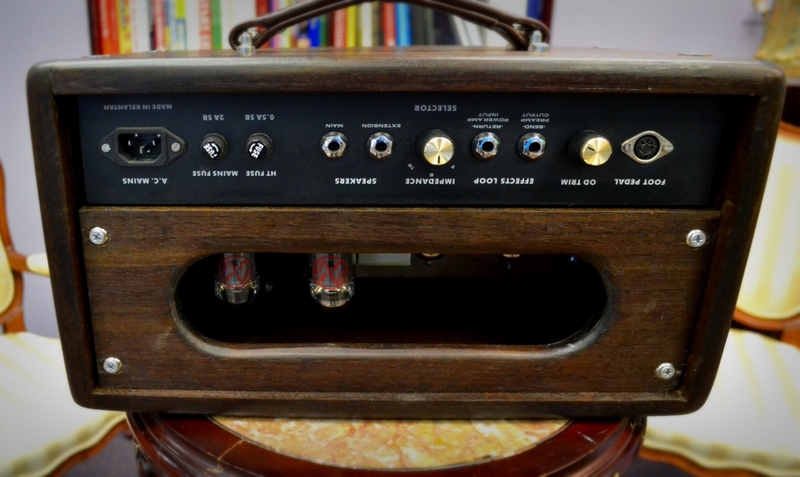 I wanted it to replicate the layout of the original Dumble ODS, which is 'top mounted' but the faceplate that came with the amp was 'bottom mounted'. Hanging the chassis wasn't so bad, but I needed a new faceplate, plus the original was really bland, so I designed a new one that copies the vibe of the Dumble much more accurately. I'm really happy with the way that turned out! I'm really digging this amp. I wanted something versatile that takes pedals well, something 'lunchbox' for size and wattage (wanted to be able to crank it), something that stays clean at high volumes but has some gain on tap so you can plug directly into it. I'll be doing the majority of my recording with this for a while. I recorded a quick clip. It's not anything special, but for fun, I have everything at '12 o clock' except the 'Volume' 'Master' and 'Overdrive', which are all on maxed. Recorded with an SM57 dead center on a Celestion G12M-70. You can briefly hear some of the squealing feedback, since it was INSANELY loud. Wolfhorsky, technomancer, pylyo and 8 others like this. Sounds pretty heavy too, a lot more drive than I was expecting. 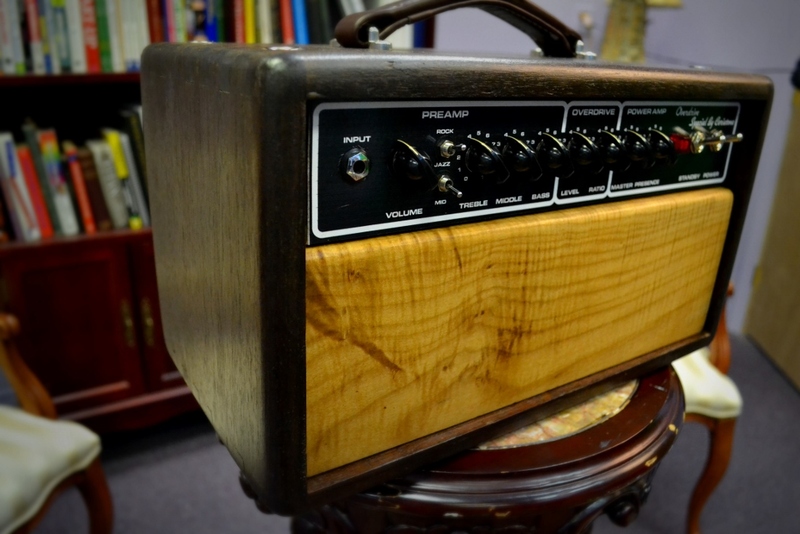 Nice job Randy, always love to see some amp built by members of this forum! You are totally right about them taking pedals nicely, I'm doing a complete overhaul of my pedal board and intend to use it at its maximum, using the effect loop and also I made a custom cable to connect the 5 pins of the amp to two singles 1/4 mono jacks, that way I'll be able to switch both the PAB and the channels using my Joyo PXL Live. Cheers man and congrats on the build! Thanks for all the comments! There's another little clip I added to my SC channel, incase anybody's interested. I just joined to say "thanks" for that video and your tips. 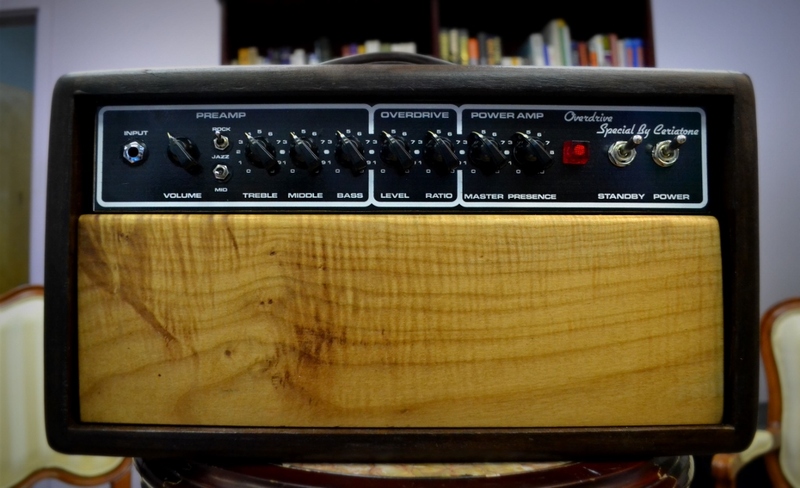 I built one of these and it's without a doubt the best amp I've ever owned in forty years of playing music and a steady stream of amps of all makes. There were a few points in the build that were unclear to me, but your video solved it : use of a particular brown resistor, the wiring of the impedance switch, and connecting the yellow wires from the PT to the bias points on the board. Mine started right up and has been 100% since. Couldn't have done it without your video! By the way, I really like that upside-down mounting -- the faceplate is awesome! Can you please tell more about how you did that? I would like to do the exact same thing. Thanks for the kind words and glad my build could be a help. The materials that go with the OTS are pretty good but there are definitely little gaps in the info, some of which was filled with the 'build tips' PDF and the rest with trial and error. Glad you're digging the amp. They're definitely exactly as advertised and 'then some'. I'm still regularly impressed by how clean it stays with the volume cranked when you have the two gain stages turned off, and then how well it breaks up once you start adding them on. Super underrated amp. As far as the faceplate, yeah, I was less than enthused with the stocker. I noticed the knobs are in exactly reverse order of the real ODS and the chassis on the bottom rather than the top, so it seemed to me they originally intended it to be mounted the way I did it. As far as the 'how', most of it was just scanning the original one to get the dimensions right, then overlaying a new graphic in Adobe Illustrator. I forget what font I used but I got a good resolution copy of a Dumble faceplate and used 'What The Font' to get as good a match as possible. The faceplate itself I had made by a local sign maker. He makes those foamcore political lawn signs and assorted vinyl cut decals, etc. Anyway, I gave him a PDF and he printed it into a glossy 'indoor/outdoor' adhesive backed vinyl sheet. He also threw in a think plastic backing as reinforcement and thin clear plastic to put infront of the faceplate to hide the texture of the vinyl. That ran me less than $30 and he threw in a few extra printings (which unfortunately were ruined because I left then outside). The only other 'thing' I needed to do was cutting out the holes for the pots/Jack's/switches. I stuck the adhesive vinyl to the plastic backing to keep the vinyl from twisting when I took a drill bit to it. I took the original face plate and put it over the vinyl, then filled in the circles with dry erase markers to get the diameters right then drilled them out slowly with a Brad point bit. I went super slow to give the edge of the bit time to cut and prevent twisting. Took some digging but I was able to find the PDF of the faceplate, so feel free to use it. Good luck! jonT and budda like this. Wow, that's just perfect -- really pro work you've done. Thank you for sharing the overlay graphic and just as importantly -- the "how" and details of its construction. Hey guys, thought I'd update you all with my progress. I called around the local sign shops, and visited a few more in person to get quotes for laser engraving in two-ply pastic. The price quotes were all over the place -- the highest was $170! (no kidding). I found a local craftsman engraver that could do the work at a great price, so long as I wasn't in a hurry. Worth the wait. One funny thing -- with the amp installed upside down, and all the controls are inverted, I spent a day re-learning how to adjust the thing. I had built a mental model of where all the knobs should "look" for certain tones (John Mayer, SRV, VanHalen, AC/DC, Beatles/Vox, etc.) and now everything was in the wrong spot and I couldn't seem to work it any more. I'm adjusting again now. Oh, the printer made a change to the pdf you sent, Randy -- we switched the jazz and mid words around, so I don't have to rewire the switches. The power and standby switches can simply be flipped over (so that "on" is up) but the jazz/rock voicing switch and the mid-boost switch would require desoldering components and such. Easier to just move a couple words, so that's what we did. When that panel comes in I'll update with a final pic. But it's close to complete and I'm pleased with the results so far. Thanks again, Randy, for the video help, and for sharing that graphic!